Perhaps the only advantage to waking too early and not getting back to sleep is I can get on with writing up the rest of my post about the Kona taper. That way at least it’s all out there before the race happens! Then you can judge its merits and my approach on the results that follow. They’ll be no hiding from this one! It’s early Thursday 1st October as I start this. Which is ten days out from the race. Ten more days of training that can have a big impact on how things go. I ‘officially’ started my taper on Sunday, but despite that is was only yesterday afternoon I finally finished drawing up something I was happy with. There’s been a lot of debate and theorising behind it. Occasions where I’ve gone a little astray. Doubts about how much or how little to do. Concerns as to whether it will work, but I am now committed. Anyone following this blog particularly of late will be well aware how interested I am in the numbers behind the training. I can’t claim to be an expert, but I try to read around the subject and learn from what I do. For the first time I’m taking a far more analytical approach to a taper. In part one I looked at the performance values leading into my recent races. Those values were the guidelines for all the taper planning to follow. Take a look back there if you want to see what I think my season has told me so far. I established some target values for my TSB, CTL and ATL in part one. The next step was to put some workouts into WKO+ and estimate their training stress. By doing this I can have the software project the values of TSB, CTL and ATL in the run in to the race. 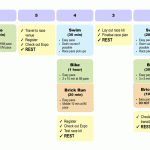 Remember I’ve decided to treat the bike and run separately (and ignore the swim for now) and had goals for each. So with a little bit of work I’ve planned a series of workouts that get my bike TSB to the desired 20-25 region the day before raceday. Add to that the drop in CTL has ended up pleasingly close to the 10% guideline. A little higher if you only consider two weeks for the taper, rather than the three in the table. Still this is looking pretty good. I should have slightly better form than Roth and be more rested if I’m right. Running has proved much tougher to balance. The TSB is honestly slightly lower than I’d like. I could cut another workout from the schedule to try to achieve that (perhaps it’s just how tempting dropping today’s 20 minute run is!) The difficulty here was controlling the drop in CTL though. To get the TSB any higher my CTL would drop by a lot more than 10%. You might argue from Ironman UK I can potentially handle a larger drop anyway. I suspect if any workouts get left out over the next ten days they’ll most likely be runs. Whilst I’ve not focussed on the overall performance management data much I was pleased to notice that the resulting TSB whilst high compares favourably with Roth and Ironman UK. Also the drop in CTL seems to be comfortably in that 10% guideline too. If ATL is judged I should be well rested too. The real art of the taper is arranging workouts that get the balance right of form, fitness and fatigue (or TSB, CTL and ATL as WKO+ likes to know them). You want positive form, but not at a cost of too much fitness. The more fatigue you lose the better, but again to shed fatigue you have to lost fitness. That’s what the numbers above are guiding me on, but ultimately it’s come down to me to develop something that would work. I’m nervous because this is new and experimental and I don’t know if perhaps I’m doing too much still. Taper means resting, but am I? I think things have been easier so far this week, but I am feeling tired right now! That could be the amazing massage I had though or the long lecture I’ve just given on using WKO+! Either way once this post is done there’s an embargo on training conversation from me. The layout of my taper has been influenced by two things. Firstly the extra bit of riding I did on day one out here and secondly the idea of a three days hard to one day easy cycle I’m tending to lately. Essentially my taper consists of three such cycles each smaller than the last. More rest comes in and durations shorten for sessions. I know some people wonder about the lack of much intensity apparent in the plan. The truth is there is Ironman intensity in there and that isn’t the same as really going hard. My rides so far have generally been easy and will continue to be so, but healthy chunks have fallen into the power I expect for race day. That pattern will remain the same as I’m not changing my approach now! The general principles I’ve stuck to is swimming every day as I feel regular time in the water benefits me and a day off might set me back. I also think there’s a lot of value in just being familiar with the swim course, especially with the way I sight! For running it’s mostly easy runs keeping the legs ticking over and minimising fitness loss. Some time is spent close to Ironman pace, but again simply because that’s not fast running. I’m running regularly, but not for long as that’s how I’ve tended to train in my build till now. I’m biking a lot this week I’ll admit it. In fact if you look at the hours in the chart below you might question if this is a taper at all. What you should bear in mind is that over the past few weeks I have scaled down the volume. Two weeks ago I trained for 45 hours in France, last week for 35 and this week for under 28 hours I imagine. Next week things really get easy. A mere six hours training in the lead up to race day. That’s when I really shed the remains of the fatigue. The aim will be to rest, rest and rest some more. Chill out and relax as much as I can and not stress. That’s the final part of the art. Having all the numbers I like to guide me, but ultimately being willing to let that go and relax if it seems too much. They do say it’s better to be more rested than not come race day. Right now perhaps I’m in danger of pushing too much? It almost makes you wish it was a pure science! Guided by the science and mixing in the art of tapering these are the final plans! Hours 1:15 3:50 5:30 6:00 6:45 ??:?? ??:?? As we walked back from Lava Java this morning Steven made a very fair point to me. It’s all very well drawing up plans, but I need to stick to them. I admit Monday looks nothing like my original plan. I was drawn into doing more than intended, but I think it worked out fine. Now these are online for all to see I will state this is the most I will do in the run up. Also to emphasise a point the times are a guideline. Whilst I’ve not included it for simplicity I will mostly be guided by training stress for each session. The aim is to control my taper by reducing that, lowering the time and intensity of workouts is the way to achieve it. Come the 11th I will be in a position to assess the taper and how it worked in the real world rather than in a spreadsheet. I hope to have good news! I’ll briefly do a review of my fifth build week sometime soon, but from now on the analysis is done so you can expect more pictures and stories from Kona to come.